Wow! It’s almost time for the A-Z April Blog Challenge again. It will be fun finding blogs new to me. And expanding my list of online friends is always a good thing. I had so much fun writing about musical acts (factual and fake) last April that I decided to do it again. Only this time it’s not music I own (at least not at the time of writing these posts). Instead these artists’ tunes receive airplay on WNKU out of the University of Northern Kentucky. This member supported station plays all sorts of music including hourly inclusion of local natives. Few of them are featured on any of the area’s commercial stations. And if they do get commercial airplay, WNKU tends to pick lesser known tunes. Anyone interested can find WNKU’s website here. The web page features the current playlist and live streaming. I hope to “see” you throughout the month. Happy blogging! PS Interestingly, this year the final day falls on a Sunday, which normally is a day of blogging rest. If you are joining the challenge, will you post Z on Sunday or a day early/late? Technology and I are uneasy partners at best. Sometimes it works to my advantage. While I watch fellow writers check their social media or struggle with streaming music I am happily writing with my iPod. At home I prefer to use iTunes directly with my low-tech but awesome sounding USB speakers. That way my ears don’t get sore with headphones compressing the earpieces of my reading glasses for hours at a time. I struggled with iTunes for a long while, unable to figure out how to play soundtracks. You see, I turned off compilations within the options to make integrating content between the software and my old scroll wheel iPod easier. Yeah, I refuse to even buy a touch screen iPod. A local Apple repairman lauded me. He said these iPod Classics are built like banks. I’m down to the last of the three purchased, however, the first having run out of space and the second actually suffering a fatal hard drive failure. At any rate, I finally figured out what may be obvious to others. The best way to manage my ITunes playlists is by using the song title mode. That way I can easily show my catalog by either that, artist, or album title. Problem solved. What a joy! I’m listening to “The Lost Boys” soundtrack as I type this. ~grin~ But I do like more modern stuff. Tune in during April’s A to Z Blog Challenge and you’ll know what I mean. So, dear reader, how are you with today’s technology? Are you rather a (nondestructive) luddite like me? Writing about a tour bus breaking down on my fictional band, I couldn’t think for a moment the name for hazard lights. It occurred to me just as I prepared to ask Google. My fingers finished typing before I could stop them. As a result I found an informative article. In the United States, not every region treats driving with hazard lights the same. I lucked out in Ohio, my instincts proving correct. Here it is legal to turn them on when driving in bad weather or through an emergency situation (i.e. you spot debris on the road). Do you ever find yourself needing hazard lights? Is it legal where you live, in the USA or elsewhere? I have some awfully clever folks among my extended friends and family. Recently, I got to spend time with my partner’s brother and lovely college age niece. Laughing over Michael’s juvenile fart jokes and how he terrorizes coworkers to this day, I heard something that piqued my writerly interest. He mentioned the title planned for his family’s imaginary memoirs. His daughter amusedly chimed in upon hearing him mention “Waiting for the Mulch King: The Story of Our Lives.” Okay, that deserved a story. Michael did not disappoint. He immediately told about a time when their children were small. He and his wife were anxious to embark on a rare couple’s date. But first they needed to wait for a delivery. As delay after delay frustrated the couple, Michael’s wife said bitterly, “Story of our lives.” Yes, apparently there is (or was) a Northeast Ohio landscaping company called Mulch King. I try not to use too many harsh chemicals these days (a little late for the remains of my eighties hair, sad to say). Still, sometimes vinegar and hot water or their harmless equivalents aren’t enough. One example is the goo on our water glasses. You see I have a penchant for lip moisturizers, to the point there are tubes sequestered all around the house – my nightstand, table by the couch, near just about every favorite writing haunt. And the stuff does not want to come off once it gets on glass. There are two very pretty glasses recently bought that I’m afraid to use, in fact. At least until today. Fed up with ineffectual and exhaustive techniques, my partner decided to try a product called CLR. It worked! The calcium, lime, and rust remover actually conquered the fearsome power of my lips! Just be sure you are careful if you use CLR. It’s so toxic that it will eat granite, so be careful of counters as well as your skin. Do you have any home care tips? I would really appreciate any you care to share. Growing up, my brothers and I were taken on a lot of Sunday drives. Whether visiting family or friends, Dad would invariably take the long way. As a result I learned a lot about driving. My father gladly schooled us on everything. I learned how to drive on ice, navigate safely with a flat tire, and how to handle detours. To this day I consider official construction detours to be for losers and commercial truck drivers. With modern GPS navigation finding another way around has become both simpler and trickier. In between my suburb and a larger town a major intersection has been blocked with railroad work. Officials want drivers to go miles out of their way on major roads. To heck with that, I thought. Immediately I remembered a long ago missed turn showing me a winding path past this closure to my desired route. Finding it again I saved the spot in my navigation system titled ‘Railroad Detour’. But when I left home this morning to head there my car kept telling me to head in a counterintuitive direction. Finally driving beyond ‘my’ detour, I once more called up navigation, this time to find again a more pleasant back road to the YMCA. Don’t you know, the darn thing still tried redirecting me to a major business route plagued with stoplights and excess traffic. So, I bookmarked yet another waypoint until I get accustomed to my course. Dad would be proud. I know the minor rebel in me is happy. Do you, dear reader, enjoy driving? Do you like bucking convention? My little Jezebel is really the quintessential cat. She wants attention on her schedule or not at all. It’s amazing how often that happens when I am on a phone call, the more important the better. The other day, however, she wanted to ‘help’ me with laundry. I ended up getting this shot of her in my sock drawer. What's With the Flash, Mom? Do you have beloved furbabies that stalk you? I know for a fact that many of you dear devoted readers are wonderful animal caretakers. ~hugs~ Happy snuggling! I have been working out for a little over two years now. While I could still stand to lose weight my increased strength has made worthwhile the hours spent. Resistance training has become enjoyable even. It grounds me to the physical, an important thing for someone usually locked in cerebral pursuits. My least favorite part is cardiovascular exercise. Aside from swimming, which feels almost like flying, the process is painfully dull. Not even music or books make the ordeal easy. I would rather be at home writing. Then I found a fitness guru online who recommended circuit training without breaks between sets. He touted the increased heart rate to be every bit as good as jogging. And trust me when I say that I never run on treadmills. I walk. If you want to attempt this I highly recommend talking to your doctor first. It can be pretty taxing. I am good at listening to my body. At first I could only manage nonstop training with lower body workouts (alternating between split body routines allows me to go more often). Now I’m able to handle nonstop workouts with every session. Not only do I feel the intensity, the time saved means more writing before and/or after. It’s been great. Sometimes the intensity earns me notice from other members. I don’t mind. It’s kind of flattering to this aging lady. How about you? Do you have an exercise regimen to recommend? I lead a charmed life, I truly do, or maybe it leads me. ~grin~ Yet I do face occasional stress. Social anxiety is perhaps the most common and very much a trigger for me. It’s an effort to mingle with strangers at the gym until I get into the physical groove and zone out. Sudden noises, not even necessarily loud, are another problem. Our home is very quiet, free of barking dogs and noisy people. My pets are two elderly cats and tropical fish, all very Zen companions. At my neighborhood YMCA families troop through nearly nonstop. That’s especially true in the locker room, which naturally provides natatorium access. I cannot count how many times I have finished a relaxing swim or been grounded by resistance training only to have my calm shattered by slammed locker doors and screaming toddlers. A few weeks ago I faced yet another swim meet. Besides self absorbed sports enthusiasts bowling me over at every turn, the announcements were broadcast in the locker room at deafening levels. While in the fitness room I debated whether or not to bother showering there. I considered asking at the front desk if the sound could be lowered in the locker room. It seemed unlikely. If only I had cotton with me, I thought. Then I remembered my cotton tipped ear swabs. Unfortunately that idea failed because the swabs were too narrow and could too easily injure my eardrums. Ultimately I ended up using pieces of a torn up facial tissue. It worked, giving me an idea. I went home, bagged up some cotton balls, and put them in my backpack. Now I block my ears upon every visit to that locker room. It has made a huge difference. I just wish the idea would have come to me sooner. How about you? Do you suffer anxiety? Can you offer any suggestions on how to cope short of hiding in your house (which I have been known to do)? Anyone the least bit familiar with me probably knows that technology and I don’t get along terribly well. Lately I’m even having trouble with chip reading credit card machines. At my doctor’s office the receptionist finally had to put my Visa through for me. Then at the grocery store weeks later I suffered the same indignity trying to charge a purchase to my credit union chipped debit card. “You cancelled the transaction,” the frustrated clerk kept saying. At least the keypad accepted my numeric password. I was starting to wonder. It’s insane. I can’t help recalling how digital watches never lasted long on my wrist either. They always kept slow time or stopped altogether. A longstanding joke in my home is that if something happens to my tech savvy partner all is lost. Every gadget in the house will gradually seize up and moss will grow over everything. The cats and I will go feral. What do you think? Could I perhaps have a wonky electric field emanating from my body? 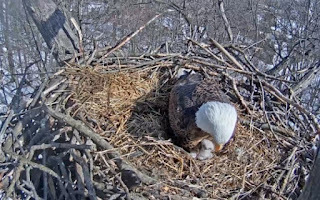 I was technically supposed to do this yesterday but the Hanover Pennsylvania eaglet hatching caused me to post twice as it was, an unprecedented occurrence. So, today it is. And my challenge topic? Music. Music. Music. Compared to some, my topic is probably pretty staid, especially considering I featured music last year. This time, however, I first heard these acts on a local college radio station. My commercial “alternative” radio station has become just about anything but. WNKU, however, broadcast from the University of Northern Kentucky, fits the bill beautifully. In addition I will again manufacture a band or performer for each letter of the alphabet. Those silly blurbs give me another creative outlet. How about you? Do you plan on joining the April challenge? Introduced to podcasts a few years ago, I have found them a wonder when forced to drive long distances. No longer do I struggle tuning in a good music station only to have to start over in another ten or twenty miles. Apparently, podcasting is still a fledgling industry. So the hosts of the various programs have asked their followers to share their favorites with family and friends. They know that furthering one will benefit all. Surprisingly I could not even find ‘TryPod’ (get it? Try a podcast?) with online searches, so maybe I’m spelling it wrong. Or maybe that's telling something about Internet and radio conglomerates not wanting their audience taken away. Anyway, my favorite podcast is called Stuff You Should Know hosted by Charles Bryant and Josh Clark. These guys are hilarious, though sometimes they ramble pretty far off topic. I have mentioned them before, in fact. They take something that sounds completely boring, such as grass, then proceed to entertain and inform. My partner and I have taken to listening while we run local errands. If the show hasn’t concluded before we come home, we often finish listening on the couch. A favorite has to have been the one on professional clown hierarchy. Do you listen to any podcasts? Please share in the comments. This is likely the first time I have posted twice in one day. 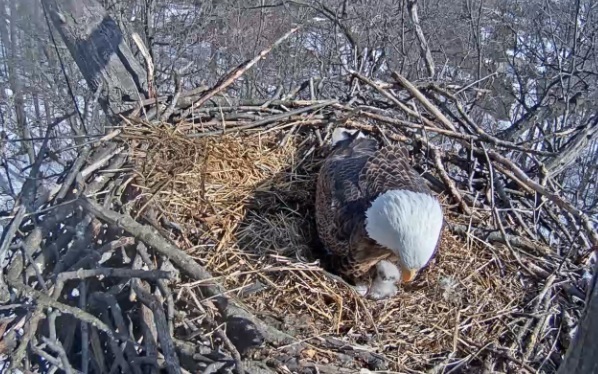 The news from Hanover, Pennsylvania’s live eagle cam warranted it. How’s that for a Zen moment? I’m sort of a harmless, garden variety rebel. Hyphenated catchphrases make my skin crawl. It still pains me to even type ‘stay-cation’ and ‘man cave’. Now there is ‘drop the mic’, apparently coined for some diva or other (male or female) who hit the high note and flounced off the stage. I really don’t care where it started. But the other day I coined my own axiom when something so clever flowed onto the page (in my journal, no less), that I threw down my pen. That’s for all those writers out there who amaze themselves with their own cleverness. Of course this is probably the only place I will share the phrase since I’m a solitary writer living in a state of semi-hermitage. Are there any pop culture expressions you either love or hate? Tell me in the comments. I had to practically race out of the YMCA this morning or risk swallowing my tongue. It was all because a man stood directly outside the woman's locker room. Normally I would greet someone so nearby. But what could I say when he stood there holding this adorable stuffed rooster by the neck? I couldn't think of a single thing to say that wasn't risqué, not quite appropriate for my surroundings. Passersby probably thought I was having a stroke. Should I have at least tried to say 'hello'? Always one to tinker with solutions, I found a better setup at my actual desk than at the table like I photographed the other day. Ditching the now too tall footstool, I found a replacement in a sturdy box. This, I think, will be a place I can sit for hours and hours. Complete with Marilyn Manson Mousepad! This end of the house is chillier but my stories sometimes get me a little steamed up, anyway. ~grin~ Now enough silliness and back to the business at hand! Ask most any author and they’ll tell you that editing and rewrites are the least fun part of creating story. To my delighted surprise, that hasn’t been the case as I read and reread the first seven novelettes from my shapeshifter series. 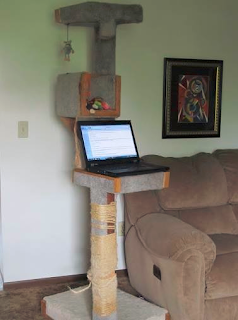 Last week I even stumbled upon a better way of proofreading. It started when I created a multi-faceted Scrivener document. Within that software I created a separate folder for each of the fifteen tales. Meanwhile I’ve been rewriting each installment within Microsoft Word. This old 2003 programming actually makes the process faster and more efficient than Scrivener by better correcting little spelling mistakes as my fingers fly across the keyboard. Then, a week or so ago, I decided to read books one through seven yet again (!) before reworking number eight. It’s amazing how many tiny tweaks continue improving the flow and continuity of my prose. Now comes the probably strange sounding, monotonous step. Wanting to keep my Word and Scrivener documents both up to date, I could go through the entire MSWord document and copy and paste it fully into Scrivener. Makes sense, right? Instead, I started copying and pasting edited passages – most often paragraph by paragraph – as I retyped them. But I plan to continue in this manner, at least with these most polished pieces. I find it’s helping unearth little tidbits missed in countless prior passes. For example, when 'must' should have been spelled 'much' (???). How about you? If you are a writer, how do you feel about rewrites? Do you love them or hate them? Do you have any tips on how to best catch mistakes? Romance is long dead in my house. In fact, my partner has never been one for romantic gestures. Admittedly, I sort of shot that in the foot when we first met and I lamented about my former lover. That one delightfully displayed romance in spades but couldn’t hold a steady job (back then I wanted nothing more for us than to move out of our childhood homes and into a place together). There Are Worse Things Than Getting Older. Happy Birthday! At least we still laugh together after all these years. That is better than flowers and candy any day. I should have posted this earlier but got ahead of myself scheduling entries. We actually saw our first turkey vultures before February even ended. On March third I stepped out my front door to check the mailbox and saw a flock so large they startled me, nearly blacking out the blue. There may have been five hundred in perhaps a square quarter mile of sky. Unfortunately they dispersed in the time it took me to run inside and find my camera. Snapping away, I photographed the last westward flying birds. For the fun of it, here is an old photo from June of 2013. Unfortunately our neighbors had to cut down this great, dying tree. Hinkley, eat your heart out. We Southwester Ohioans deserve a Buzzard Day. Needles don’t bother me, nor the minor sting. And I’ve never suffered ill effects. I just always wondered if they were a moneymaking scheme for corporate US medicine. Then I learned that the shots are free this year at a certain big ‘discount’ department store. Suffice to say it’s the one affiliated with the big ‘box’ store, Sam’s Club. So my partner goes and raves to me over the phone about this new bandage that the needle goes through. Apparently the new technology lessens the sting. It turns out the needle wielding pharmacist says after the fact that they want vaccine recipients to report back after several minutes to report how he or she is feeling. Besides being rude (what if the person has somewhere to be in five minutes? ), that is pure garbage. The store simply wants consumers spending money on crap they don’t need. I am sure of this because nurse practitioners in past flu seasons always ushered me out the doctor’s office before the needle was cool. Besides, you can’t tell me symptoms crop up that quickly. Oh, I did get the free vaccination. Then I waltzed out the door. 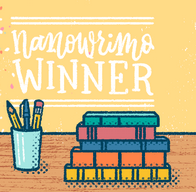 I had things to do, blog posts and fiction to write! What do you think? Am I just being paranoid?